The most memorable highlight of our recent stay Ngoma was a dramatic encounter with a leopard on the Chobe River. Bevan, our guide, was the first to spot the leopard neatly camouflaged in the thick Chobe bush as we were driving by the river. 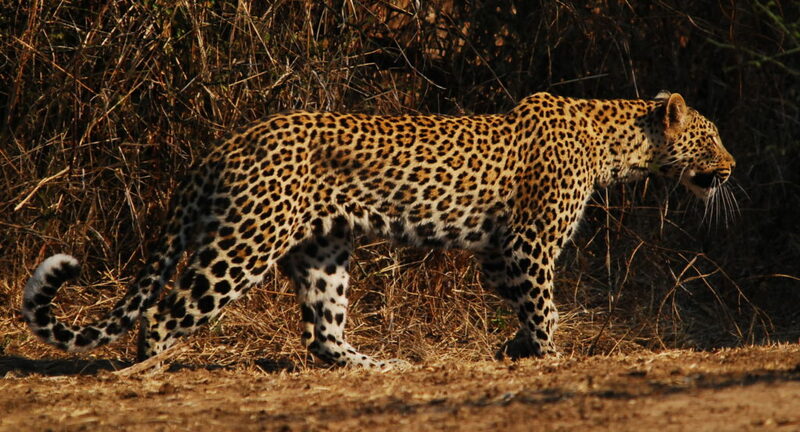 The big cat immediately broke cover, casually walked past our vehicle, and commenced stalking a herd of impala. To our astonishment, the leopard sprang and brought down an impala with clinical precision. There was no time for a photograph—we were transfixed with what we just witnessed. Bevan was able to bring us closer to the leopard and we watched as the animal, with a clear sense of purpose, slowly choked the impala to death. Once the impala was lifeless, the leopard demonstrated its obvious strength by dragging the unfortunate impala away into the undergrowth. Nothing about the episode was brutal or unpleasant. It was a true reflection of life and death in the wild! This experience will forever remind us of our wonderful stay at Ngoma Safari Lodge—with its fantastic location, stunning views, faultless hospitality, excellent accommodation and gourmet meals.